Stepping out to the Empress Room for dinner has always been a celebration of culinary delights, but since the recent $60 million-dollar property renovation completed in June, Q at the Empress has morphed into a gorgeous, yet approachable dining destination for locals and tourists alike. If you’ve had the pleasure of dining here in the past, the first thing you’ll now notice are free-form white ceiling lamps scattered around the room. San Francisco’s Puccini Group used a colour palette inspired by the Empress Hotel’s own tea china. The cheeky series of mauve-tinted artwork reflects Queen Victoria during different periods of her life. The Art Deco-inspired elements marry well with the original dark wood beams and ceiling accents together with the inviting fireplace (also original) at the back wall. The redesign/rebrand pays homage to the Queen — and to Victoria, BC. 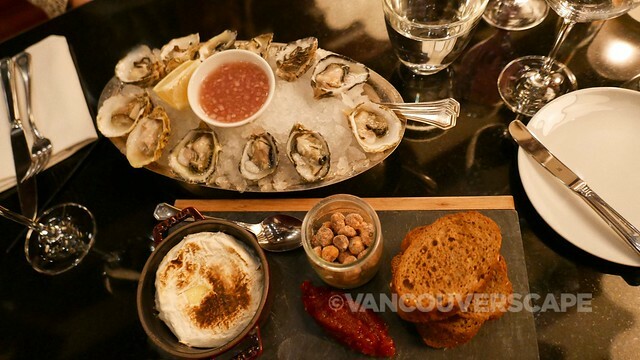 While Islanders can discover some of the local producers around the island in Executive Chef Morgan Wilson’s dishes, out-of-towners get a great glimpse into Victoria’s Pacific Northwest cuisine. To start our dinner, we decide on the Empress 1908 coloured a vivid indigo blue that changes colour when citrus or tonic is added, becoming a gorgeous purple-pink hue by the time it’s ready to be enjoyed. The unique colour’s derived from butterfly pea blossom added to the all-natural gin, handcrafted in small batch (240 gallon) copper-pot stills. This sipper took top honours at this year’s World Beverage Innovation Awards for Best Alcoholic Drink as well as Gold Medal in New York’s World Wine & Spirits Competition. 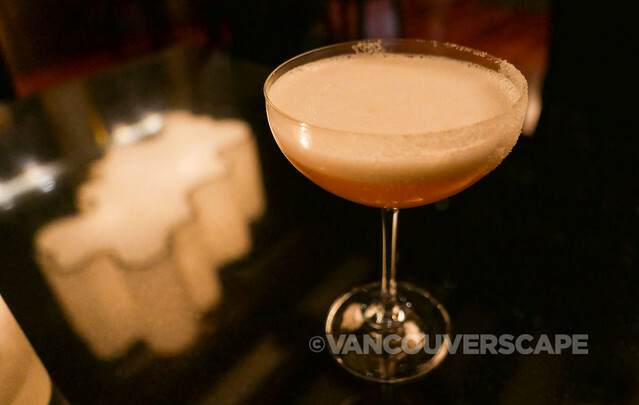 I highly recommend the Classic 1908 as well, prepared with Finlandia vodka, Empress tea, egg white, lemon and simple syrup. It’s a simply delightful start to the evening. A well-curated wine, bubbly, cocktail and craft beer selection rounds out the drink offerings here. Each month, Q at the Empress selects a featured farmer (this month, Farm House Cheeses from Agassiz). My dining mate and I decide to take full advantage and order the baked brie starter with quince jam, roasted hazelnuts and homemade crostini, perfectly suited for a glass of Tuscan white wine from Tentuta Guado Al Taso. And honing in on the Pacific Northwest, we next order a plate of beautiful Kusshi oysters on the half shell, accompanied by venturi schulze verjus and huckleberry mignonette. Entrees range from slow-cooked bison short rib with fingerling potatoes, local carrots and Brussel leaves to pan-seared sablefish with pickled seasonal mushrooms, fingerlings and bacon. My eyes are drawn to the roasted Kundera salmon, made into the quintessential fall dish by including red cabbage puree, Beluga lentils and turnip. We’re feeling pretty full by now but I can’t leave without trying a piece of Empress Cake, prepared by in-house pastry chef AJ Thalakkat, who visited OR NOIR laboratory in France for inspiration. It is here that the chef sampled different cocoa pastes from around the world, gaining an understanding into their aromatic profiles. AJ’s recipe was produced in France’s Cocoa Barry factory using two types of beans (from Madagascar and Haiti). In the end, this rich and royal treat makes its way onto our table, topped with a gold-dusted chocolate crown based on Queen Elizabeth II’s own crown. Tucking in reveals the torte’s cassis layer married with the hotel’s own honey from their bee hives. It’s a decadent finish to a remarkable meal on a chilly autumn night. Not to be outranked by the torte, we also share a Grand Fir creme brûlée, deconstructed to reveal Saanich strawberries and pistachio reindeer moss. Live music seven nights a week adds atmosphere to the dining experience. 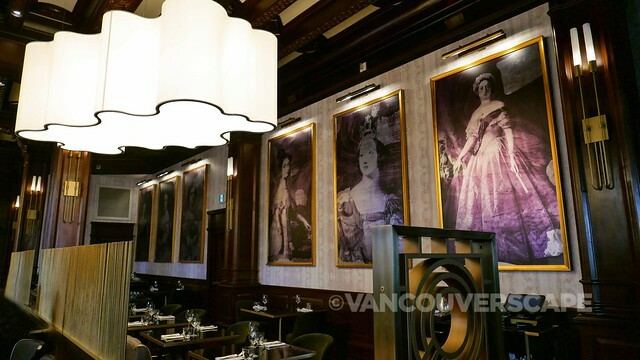 Q at the Empress is located inside Fairmont Empress, 721 Government Street in Victoria, BC. 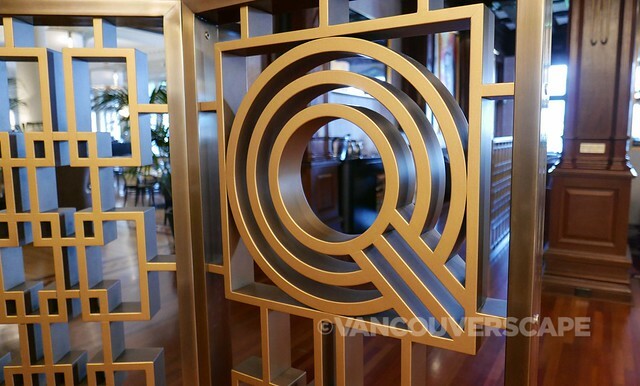 I dined as a guest of Q at the Empress. Opinions, as always, are my own. 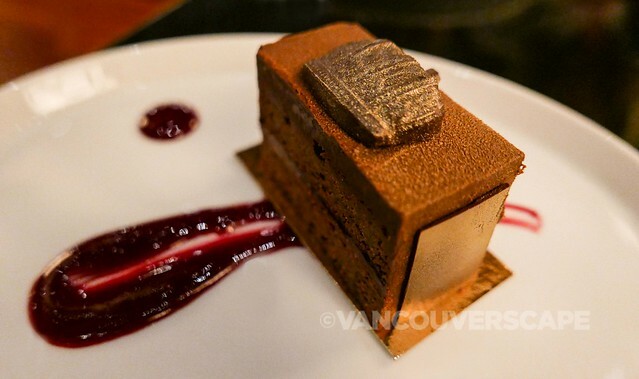 Non-watermarked images courtesy of Fairmont Empress.